Knowing that my husband would be without his mum for Christmas, I had a rummage through her recipe collection in search of her Cinnamon Roll Cookie instructions as this seemed to be the family favourite. 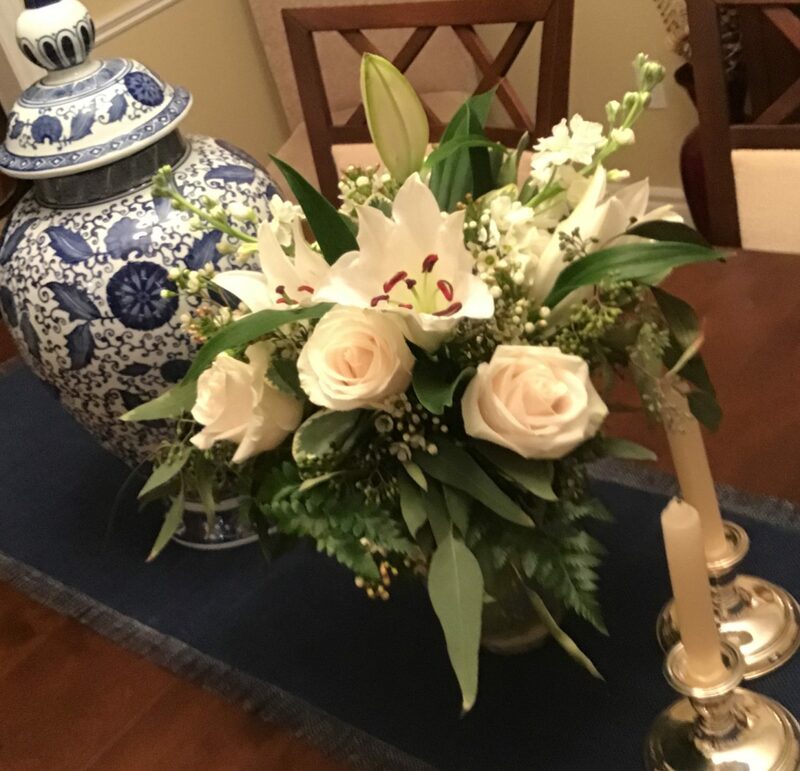 Tradition is so very important at this time of year and I was keen to make sure that my husband would still be able to enjoy his much loved family recipes. 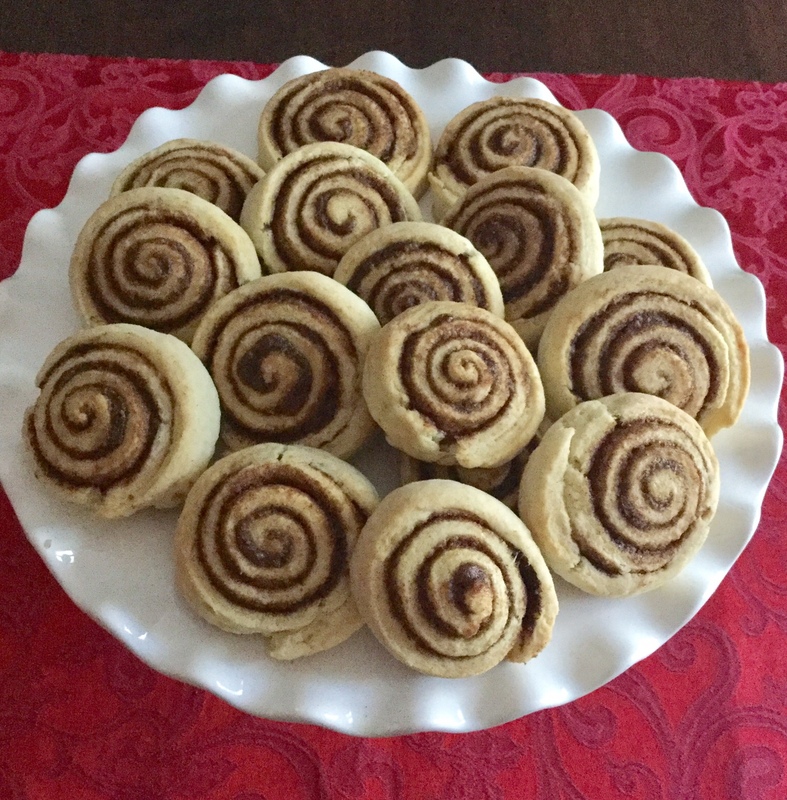 Time has marched on and I have been making these Cinnamon Roll Cookies for over 15 years now. They are always the first ones to be requested when I start my Christmas baking, and they are certainly the first ones to be eaten. 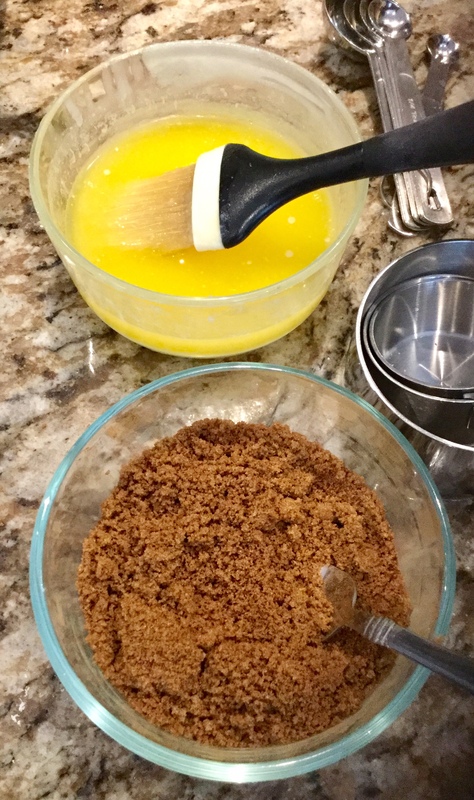 The cookie is more of a baking powder biscuit and the filling is a hat trick of butter, brown sugar and cinnamon that meld together and caramelize during baking. It is little wonder that I usually have to make three to four batches to ensure that they last throughout the season. Preheat your oven to 400F/200C and place your oven rack in the centre position. Line your baking sheets with parchment or grease/spray them. 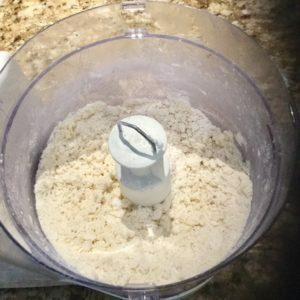 These very quickly come together using a food processor, but you can also easily make the dough using a mixing bowl and pastry blender. I have done both over the years with equal success. In the processor with the blade attachment, add the flour and baking powder. Give the mix a quick pulse to combine. Add to this the shortening. Pulse to cut the shortening into the flour until the mixture is crumbly and is the size of small peas. Add to this a pinch of salt and drizzle the beaten egg over the top. Through the feed tube, while pulsing, begin to stream the milk and water mixture until the dough comes together. 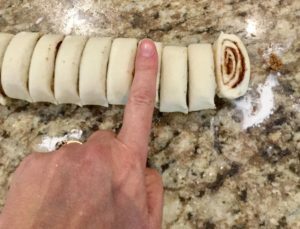 Do not overmix at this point or the dough will get tough and make rolling difficult. 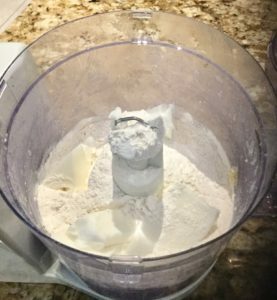 Turn it out onto a floured work surface and give it a couple of light kneads to reduce the surface stickiness and to make it easier to roll. Using a floured rolling pin, roll the dough into a rectangle, taking care to lightly sprinkle the surface and underside with flour, as needed. The rectangle should be approximately 10″ x 15″ and about a 1/4″ thick. Generously brush the dough with the melted butter. 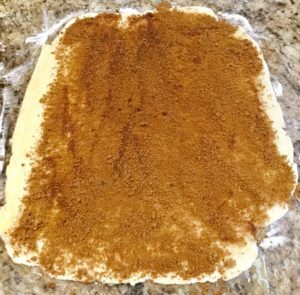 Spread the brown sugar/cinnamon mixture over the buttered dough, taking care to leave about an inch on one long side uncovered. This piece should get an extra brush of butter as it will be the outer edge of your pinwheel when you roll up the cookie. 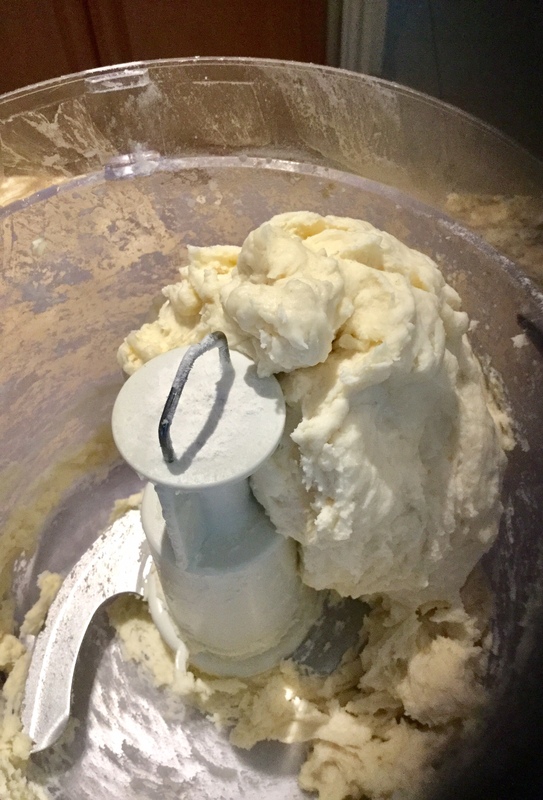 The butter will act as glue, holding the roll together. 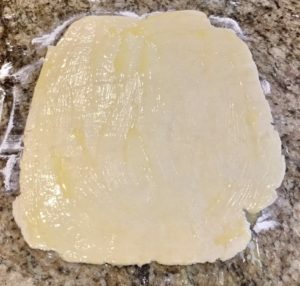 In the picture below, you will see that this is the left side of the dough. 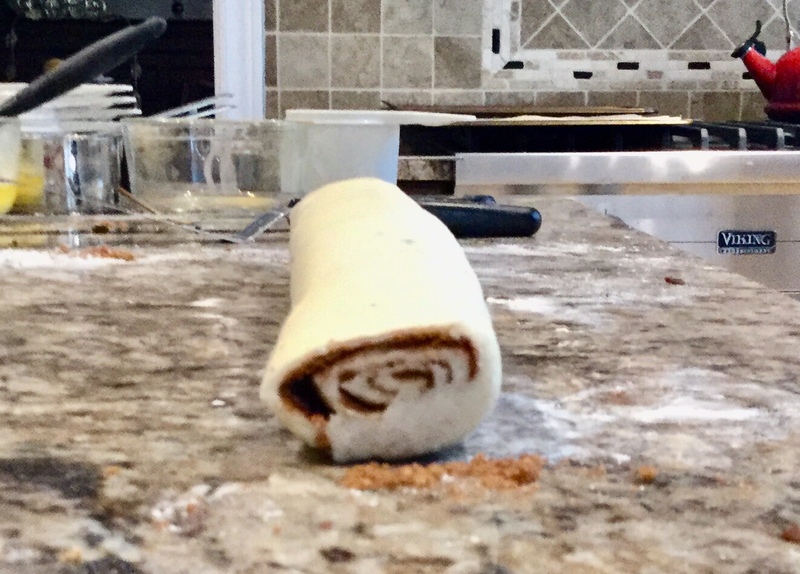 Starting on the long side that has the brown sugar/cinnamon mixture covering, begin to roll the dough to make a long log. Again, using the picture above as a guide, this means you would start the roll from the right hand side. Using a sharp knife (serrated is best) slice the log into pieces that are about a finger width in size. Place the cookies, pinwheel side up on your baking sheets. Bake for 12 to 15 minutes, rotating the sheet halfway through the baking time to make sure that they brown evenly. Preheat your oven to 400F/200C and place your rack in the centre position. 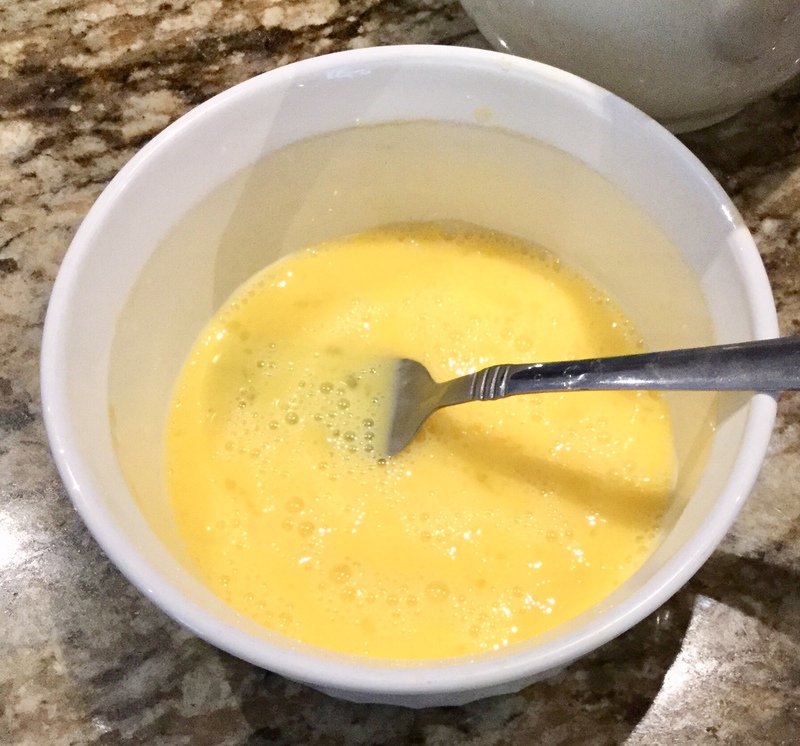 Lightly beat the egg in a small dish. Combine the brown sugar and cinnamon in another small dish. Combine the milk and cold water; preferably in a small liquid measuring cup or a pitcher that has a spout to make it easier to pour. To the bowl of a food processor with the blade attachment, add the all purpose flour and baking powder. Add the shortening and pulse until the pieces are crumbly and the size of small peas. Drizzle the egg over the top of the mixture and add a pinch of salt. 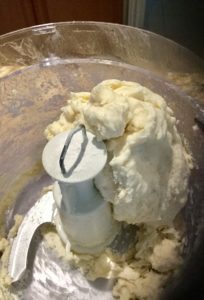 While pulsing, begin to add the milk and water mixture in a slow stream until the dough comes together. 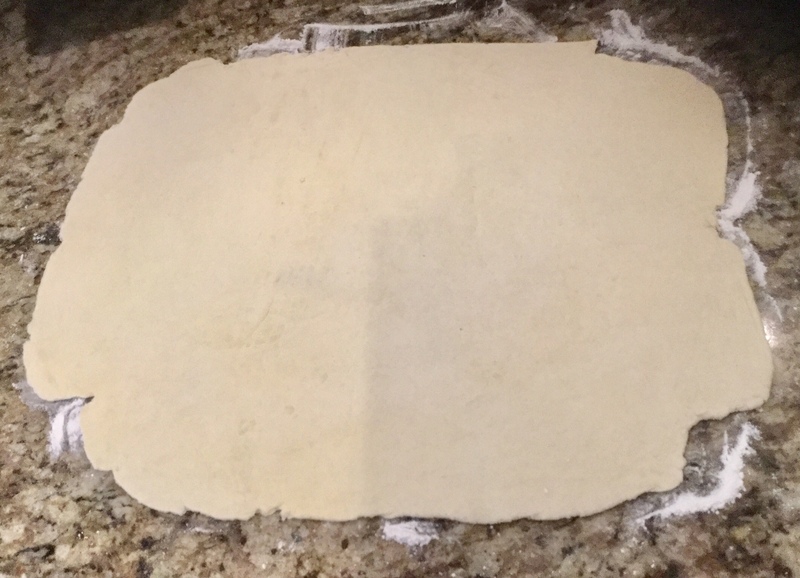 Tip the dough onto a floured surface and give it a fold or two to lessen any stickiness. 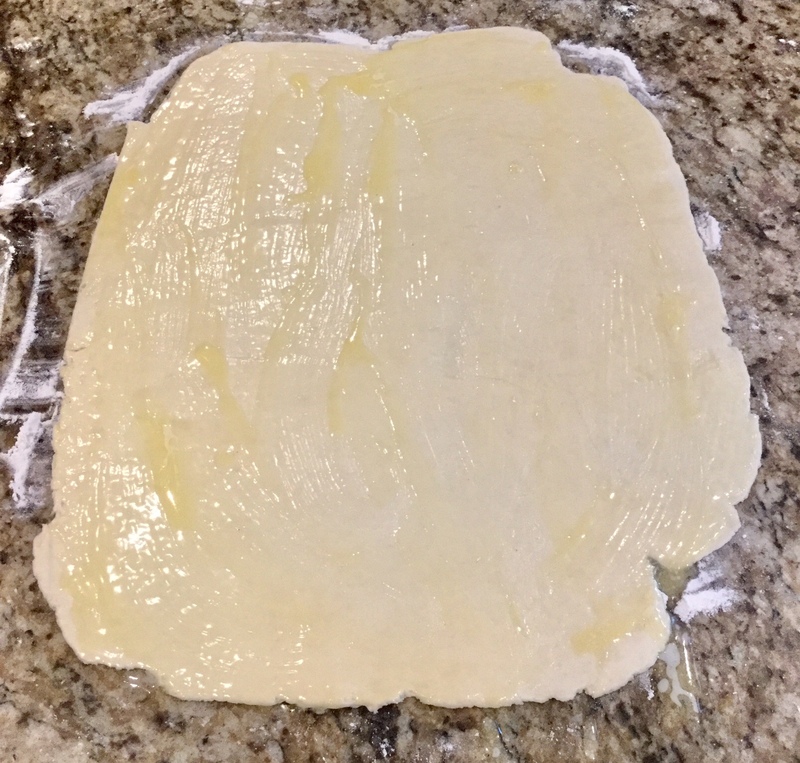 With a floured rolling pin, begin to roll the dough into a rectangle that measures approximately 10" x 15" and is a quarter of an inch thick. Pat into shape or trim any ends that are overly ragged. With a pastry or basting brush, generously top the dough with the melted butter. Sprinkle and evenly spread the brown sugar and cinnamon mixture on top of the butter, leaving about an inch uncovered down one of the long sides. Starting at the long edge that is covered with the brown sugar, begin to gently roll the dough into a long tube shape. Give the uncovered end another quick swipe with melted butter and lightly pinch it to adhere it to the log. Using a sharp knife, slice the log into portions which are about the width of your finger in size. Bake them for 12-15 minutes, rotating the baking sheet halfway through the baking time to ensure that they are evenly browned. When you pull them out of the freezer, leave them in their container to thaw. This ensures that any moisture that presents during the defrosting will be on the outside of the container and not on the cookies.